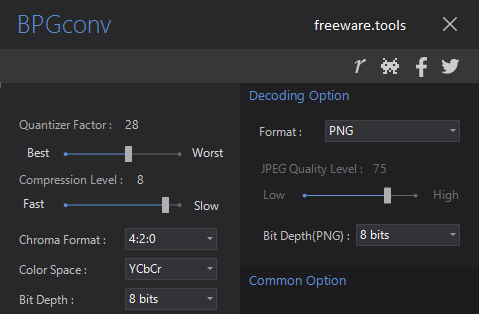 BPGconv can convert multiple JPEG or PNG files into BPG files at once. The conversion processes run parallel to each other, so they can be completed in a shorter time. You can also visually confirm the change in file size from before and after the conversion.The application interface is made up of a single screen to facilitate the user experience. It is designed so you can complete all operations without the need to go back and forth between multiple windows. You simply switch between encoding (JPEG/PNG to BPG) and decoding (BPG to JPEG/PNG) using tabs. BPGconv is a practical and efficient software solution developed to help you convert your regular pictures to BPG format, which allows for a better compression rate and thus enables you to save up space on your computer without sacrificing their visual quality. The main window of the application features two main tabs, ‘Encode’ and ‘Decode’, the former letting you obtain Better Portable Graphics files from JPG and PNG images, while the latter lets you convert them to PNG, BMP, GIF, TIF and other formats. At the same time, BPGconv features a right-side menu that can be shown or hid with a simple button click, allowing you to customize the operation preferences, both for encoding and decoding tasks. In order to add the files that you wish to process into the program, you can drag and drop them over its main window, the supported input formats being JPG and PNG. Should you accidentally load pictures you do not wish to convert, there is no possibility of removing them, at best you can reset the entire operation and start from scratch. Regardless of the function that you use, ‘Encode’ or ‘Decode’, the steps are quite similar. After adding your images, you can press the start button and within moments, the resulting BPG files are generated, informing you of the level of the decrease or increase in size, respectively; shrinking can reach even 80 percent down from the initial dimensions, without a notable difference in quality. By default, upon conversion BPGconv will export the files to a dedicated folder on your desktop, but this setting can be unchecked from the utility’s retractable menu, so you will be prompted for a destination directory every time you process new photos. In closing, BPGconv proves to be a reliable and useful tool that you can resort to for obtaining Better Portable Graphics images, a newly developed format that offers a higher level of compression for pictures, without considerably hindering their quality.